Wooster’s Moot Court team competed in the Great Lakes Regional qualifying tournament this past Friday and Saturday, Nov. 8-9. Saginaw Valley State University in Saginaw, Mich. hosted the tournament. 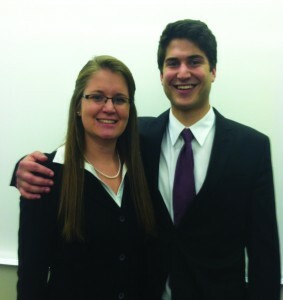 This competition was the first of three regional qualifying tournaments that Wooster’s Moot Court will compete in; teams will also be competing in Orlando, Fla., and another competition will be hosted at the College. Each year, Moot Court teams from colleges and universities around the country formulate arguments about constitutional and statutory issues raised by a hypothetical Supreme Court case distributed by the American Collegiate Moot Court Association (ACMA). Students must participate in regional competitions throughout November in order to determine which teams will qualify for Nationals. Wooster performed admirably at the competition. Roughly 30 teams from around the country participated on the first day (Nov. 8), and of those 30 teams only 16 scored high enough to advance to the second day of competition (Nov. 9), including five of the six Wooster teams. The second day was conducted as a bracket tournament. Three Wooster teams made it to the top eight, and two made it to the top four. The top five teams at the tournament automatically qualify for Nationals, which will take place at the Sandra Day O’Connor College of Law at Arizona State University later this year. Luke Tonat ’15 and Tyler Hoff ’14 qualified for Nationals, as well as Patton and Alexi Ehrlich ’15, who also took second place in the competition overall. Individual Wooster students also received recognition for their performance. The judges recognized the 10 best speakers in the competition by granting Orator Awards. Three Wooster students earned this distinction. Madeleine O’Neill ’16 came in second, Savannah Glidewell ’16 in fourth, and Patton in fifth overall. The Moot Court team continues to prepare for the upcoming regional in Florida on Nov. 15-16 and at the College on Nov. 22-23. “The counselors who competed in the Great Lakes Regional will be helping the other teams by asking questions like the attorneys we faced in our tournaments,” Patton said.